Hardtail triple butted T6 aluminium off road new style frame featuring the Bosch integral Powertube 500wh battery,teamed with a Manitou Machete Air 100mm suspension fork and dialed in comfortable and sporty geometry. 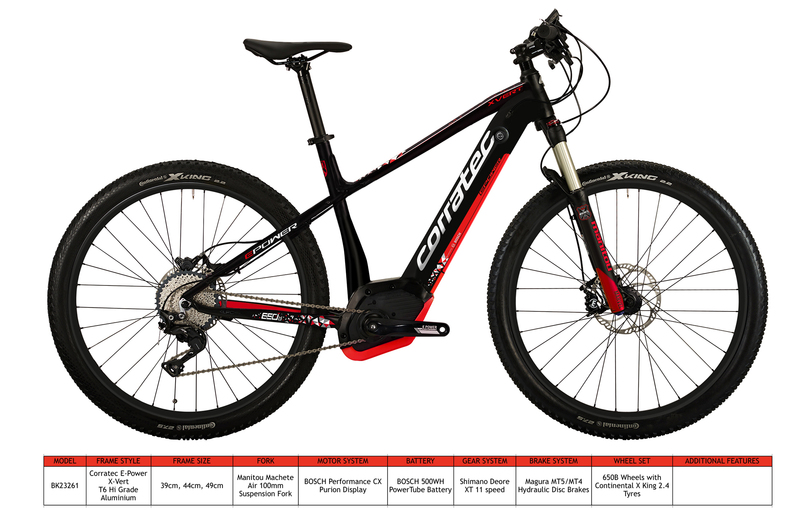 Powered by the Bosch Performance CX mid motor engine its Off-Road Performance capabilities are evidenced by an impressive componentry list including Shimano Deore XT 11 speed gear system, Magura Hydraulic disc brakes and Continental XKing 2.4 tyres. Hardtail triple butted T6 aluminium off road hardtail frame matched to Manitou Marvel Comp TS suspension for. Dialled in Sporty geometry gives a comfortable off road riding experience. 650B wheels shod with Continental XKing 2.4 tyres deliver an exhilarating off road riding experience. Industry leading- Bosch Performance CX 250w electric centre drive engine with 4 assistance support levels and full cockpit information read out. Delivering the ultimate off road power package. quick changing in any riding situation.